Millionaires visit Anfield. Over twenty of them chase a football around a piece of grass. When there is no football, they ignore the place and its cheap take away hedonism – pubs, Chinese chippies and betting shops. 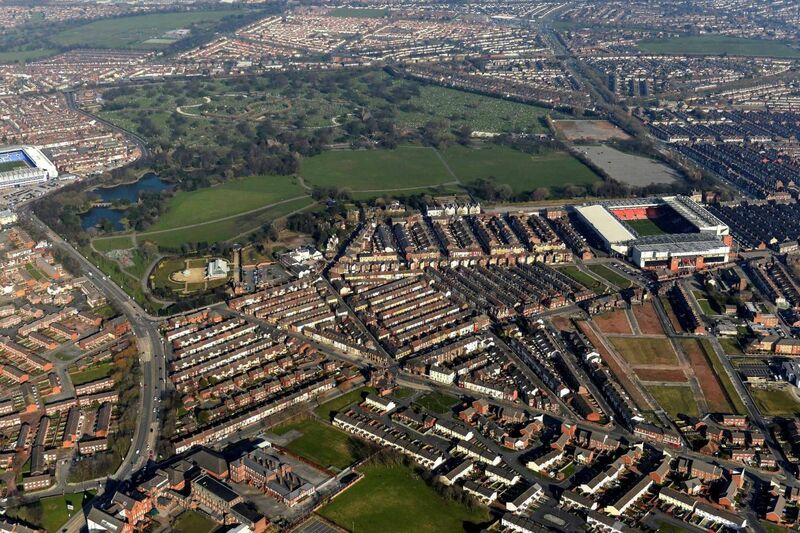 Anfield is the third poorest community within England and Wales. 1200 incidents of violence and domestic abuse occur every month and over 50 bikes are stolen. The number of weapons found is also consistent, about 40 a month. The Whitney family who were sentenced to a total of 82 years in prison lived in Anfield. Thanks to entrepreneurial innovation reinforced with sophisticated weaponry they were once key players in the supply of drugs in Liverpool. Life without them is quieter but it is hell trying to find decent Army SA80 rifles. The Anfield and Breckfield Renewal Area Implementation Plan 2014 refers to the expansion of the football stadium as a ‘landmark development’ and the Anfield Plaza as a ‘complementary gateway’. The THIS IS ANFIELD sign was created when famous footballers led modest lives. Shankly saw his team as the best of us and not the best that money can buy. Walton was an ancient seat of Christianity so the close proximity of the two football stadia of Liverpool and Everton may mean something. After the game, I would wander across Stanley Park to a bus stop. I followed figures muffled in winter clothes and I listened to pocket radios murmur match reports into the dark sky. The route from town to Anfield offers two other glorious walks. Those returning to the city centre can pass through pleasant parkland to arrive opposite the entrance to the Mersey Tunnel and alongside the fabulous neo-classical St Georges Hall. The route from town begins next to the Philharmonic Hall. The University, Catholic Cathedral and renowned Royal Hospital provide interest. Both routes take advantage of the elevated sweep of Everton Road and the terraced streets that slope down towards the ground. Anfield began as Hanging Fields. Walk down from Everton Road to the home of the most successful English football team and imagine the early religious settlement and the working class communities that followed. Bill Shankly sparked the imagination of those who lived there. If the walk does not persuade you that Liverpool Football Club is special then nothing will. The housing in Anfield is still capable of providing the satisfying modest comfort that Shankly thought important. Joe Fagan, who managed Liverpool football team in the 80s, lived in a terraced house in Anfield all his life. Welsh workers helped build the houses of Anfield. Liverpool had five large Welsh communities and Anfield was one. When Liverpool was an expanding city, there were more Welsh speakers in Liverpool than in any city in Wales. My grandfather was Welsh as was his brother who was a builder and a fan of Liverpool football team. Uncle Jack is why I admire well-built terraced houses and why I am a Liverpool fan. Like Shankly, Uncle Jack believed in working class strength and independence. Next time you visit Anfield honour the defiant spirits of Bill Shankly and Uncle Jack. Posted in Football, hillwalking, history, Horror, Liverpool, News, North Of England, Red Rattle Books, Travel, urban development and tagged anfield, Breckfield, Catholic Cathedral, Christianity, football, ghosts, Joe Fagan, Liverpool, Mersey Tunnel, Philarmonic Hall, Royal Hospital, shankly, stanley park, steven gerrard, Wales on January 12, 2015 by Howard Jackson.